Fall is in full swing, with winter right around the corner. 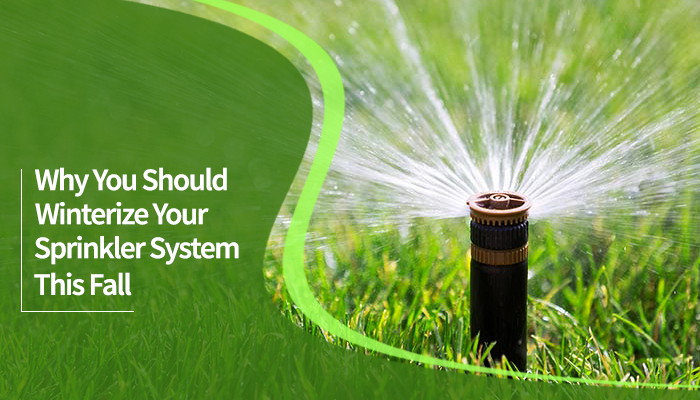 You likely have stopped using your sprinkler system long before now, but do you just leave it that way? Do you really need to go through the process of winterizing? The answer is yes! It’s not too late to do this, although it’s preferable to do it by early November to avoid those deep freezes that can start this month. When the temperatures fall well below 30 degrees, your irrigation system can be damaged or even destroyed. Protecting your sprinkler system starts with winterization. Here are some reasons why you need to have a professional winterize your system ASAP. Unplugging the timer to avoid power surges. Turning off the main water valve for vacation homes. Removing backflow preventer and valves. Adding anti-freeze to the pump. Avoid costly repairs later: Getting your irrigation system inspected and winterized before the cold weather can also help you avoid costly sprinkler repairs come spring. All it takes is one freeze to do damage, to the tune of hundreds of dollars that you don’t just have lying around. You never want to face nasty problems once you go to turn on the system in spring, so avoid those expensive consequences now with winterization. You can void your warranty: Like many home improvement items, you need to properly care for your sprinkler system in order for the warranty to cover any valid repairs. Skipping winterization is the fastest way to void your warranty, which means the company won’t pay for parts or repair for an issue that could have been prevented with routine maintenance. By extension, they won’t pay for damage that’s caused by freezing temperatures. Save yourself time, money and hassle now by having your pipes blown out. Not only can pipes and pipe fittings crack, valves and anti-siphon devices can also experience damage, which are the most expensive parts to replace. Lastly, you may be thinking: but it’s been a couple of years since I winterized and everything seemed to be fine in the spring. Well, you may THINK so, but this doesn’t mean damage isn’t starting behind the scenes. Particularly galvanized and other metal pipes, the effects of alternatively freezing and thawing can take their toll, resulting in cumulative damage. It seems to be holding strong for a few years and then BAM it splits. For help winterizing your sprinkler system in Andover and surrounding areas, call T&B Landscape and Irrigation at 844-TBLAWNS. No Replies to "Why You Should Winterize Your Sprinkler System This Fall"